I probably shouldn't count this as a recipe, but I couldn't help sharing this delicious snack idea. Many who read this may have thought of this idea before, but I was clueless! I had Cinnamon Apples at a church dinner, and I couldn't believe it was just apples and cinnamon! I had to try this for myself. For years, I put lemon juice on sliced apples to keep them from browning. I did not know that sprinkling cinnamon on apples would also keep them from turning brown! Bonus: they taste like apple pie!!!! Incredibly easy, amazingly delicious! If you haven't tried this before, you must. I've been positively terrible at blogging for, oh, what... a couple of years now?!? So, 2013, our shower upstairs started leaking into our basement and caused a house overhaul that lasted for nearly a whole year. I wanted to write posts on before and after. I had so many grand plans that never happened. Ellie and I will be talking about things we planned to do and then... life happened. 2014 looked like a great year to get back to "normal" (really, what is normal?). Lot's to catch the blog up on from 2014, too. 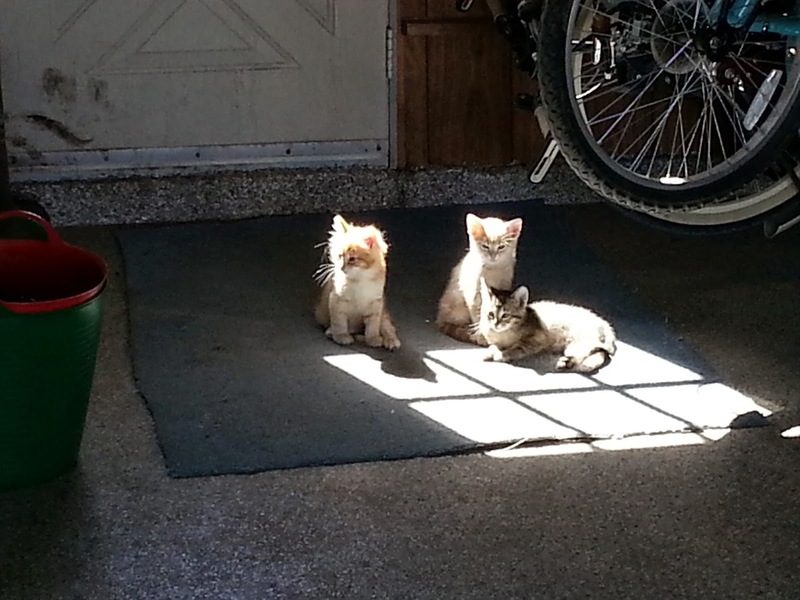 We'll start with this: May 9, 2014 we brought home these three, adorable, wonderful kittens. Sweet, wonderful family who gave us these kittens: Please, forgive me for taking SO LONG to write any kitten posts! 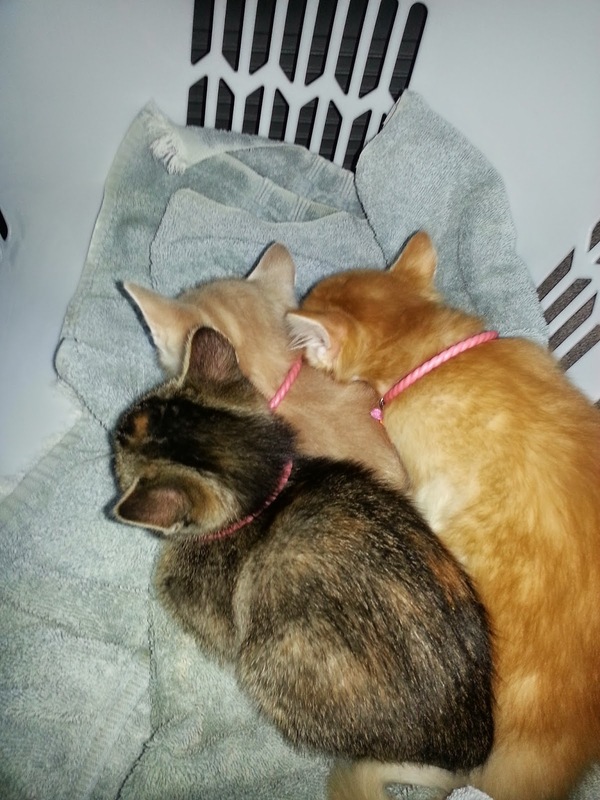 This first picture is the babies in the laundry basket that we took them home in. The oldest daughter of their family made the collars for them. The dark kitten is the little girl, the other two are her brothers. The children whose cat was the Momma named them. 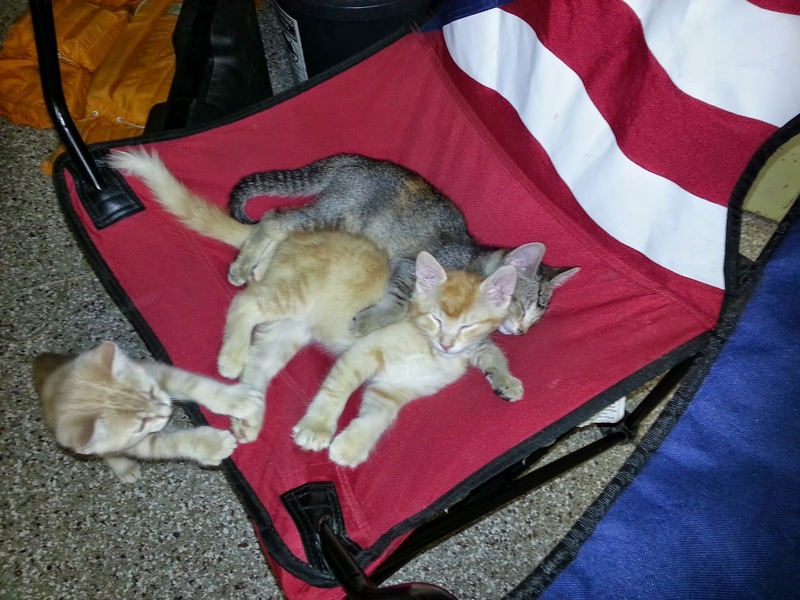 The girl was Juliet, the middle, pale colored boy named Scruffy, and the more orange brother was named Peaches. The name Peaches did not last. He is Wyatt's kitty, and that first day, he kept calling him Princess Peaches (like Mario Brothers!). We had to keep reminding him that his kitten was a boy kitty. 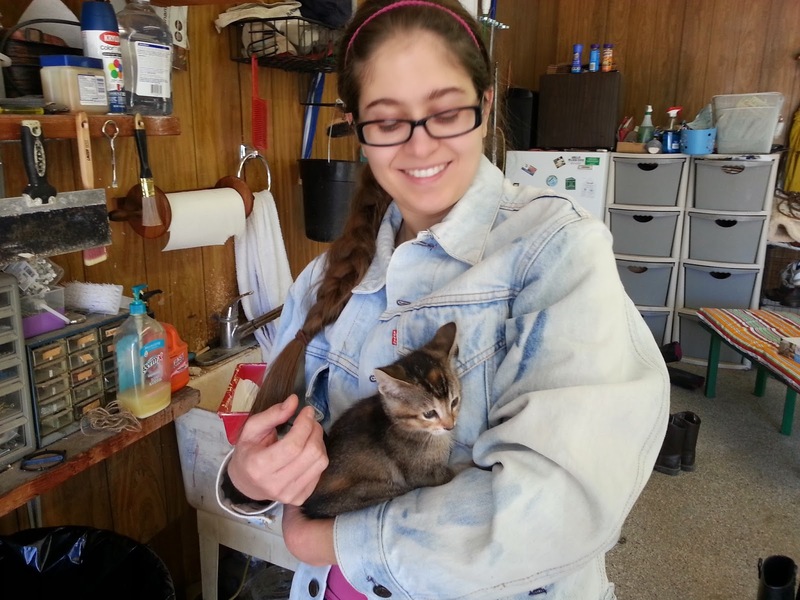 So, here I am with Thomas and I's kitten, pretty little Juliet. Her name stuck, sort-of. I started calling her Julieta (said like the Hispanic nurse says Juliet in the Clare Danes/Leonardo DiCaprio version of Romeo and Juliet), like Who-Lee-Etta. That shortened to Julie (said Who-Lee). She is also called Julie Bear, Little Bear, Saucy, Saucy Bear, Care Bear, Jetty, Jedi Jetta, and Jetta. She loves attention. She is a sweetheart. She is very loved. All the kittens are very loved! Wyatt really wanted to name his kitten Muffin, like the cat I had growing up. He ended up with a crazy long name: Bobo Fluffy Peach Muffin Garfield. Wyatt calls him Dr. Bo. We all call him Fluffy, Fluffy-pants, Fuzzy, Handsome and Bobo. He is longer haired than his brother and sister. He is super tolerate of handling, and love of all sorts. 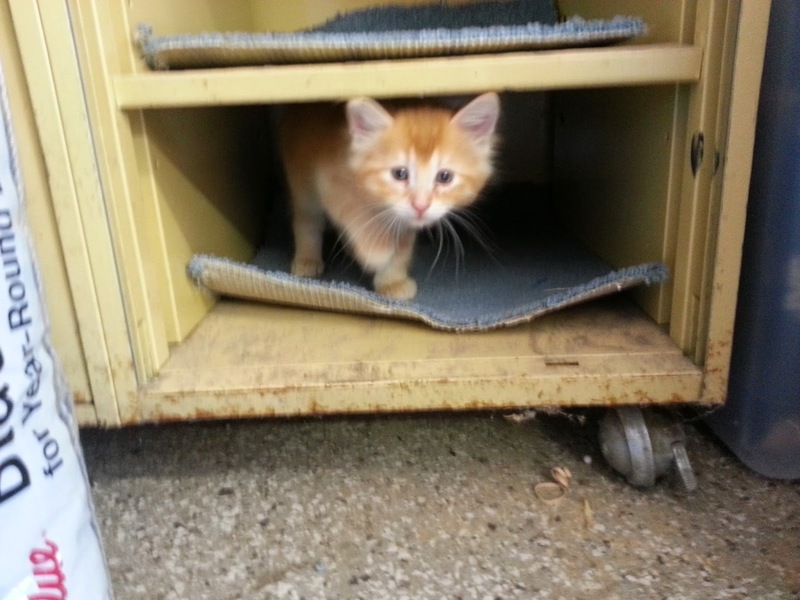 Here, the little guy is exploring the shelves of a tool box in the garage, which is the cats "bedroom". 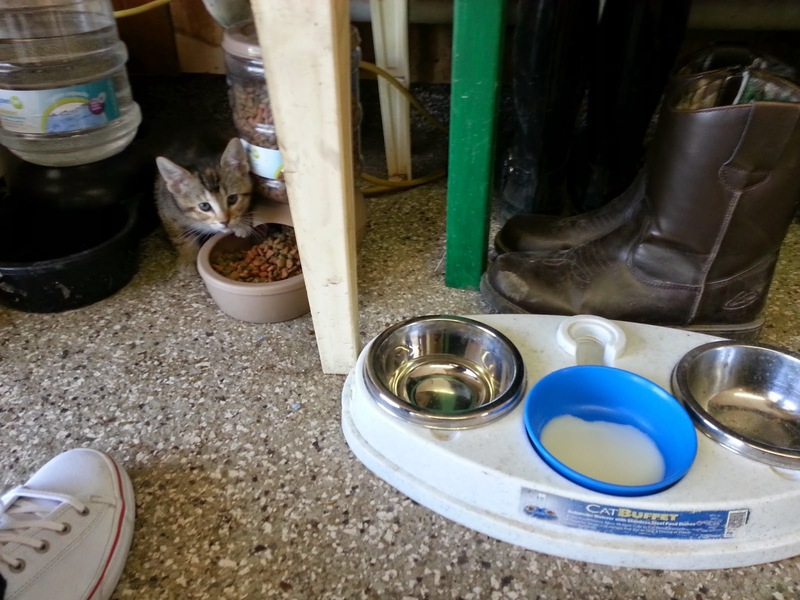 Here is little Julie checking out the food and water dishes. Here are the boys finding the cat food. Scruffy is at the front of the picture. He looks longer haired there than he does today. He and Julie look like regular short haired cats today. Scruffy's name stuck better than all the others. Though he has some nicknames, too. He is also called Handsome, Scruffle, Roo-roo, Scruffly-duffily-da, and Scruffy Pants. Lots to things have been rearranged since I took these pictures. The boots no longer sit under the bench. I need to get some new pictures loaded soon! The children with the Momma cat said that the kittens had not been out doors until the day they met us to take them home (I believe I remember that correctly. I apologize, if I am remembering wrong.). We had to take off their collars soon after we go them home. The babies were getting their paws all stuck in them. They would have soon grown out of them anyway. We still have the collars, hanging up in the garage. At first we didn't let the kittens out unless someone could watch them. We always picked them up and brought them back to the house if they wandered off too far. They learned really well where home is. Now we can let them out, and they don't roam too far from home. They have new collars. We started off by making tags for them, and buying normal collars. Those tags were way too noisy! No stealth for the hunting kittens (and they are awesome hunters!). We ordered collars that have their names and my phone number embroidered into the collar. Now anyone who finds them will know they have a home, and they can be stealthy hunters, too. They have killed mice, rabbits, birds, shrews, bugs, and snakes! I love this picture of the siblings in the sun. I believe Thomas took it, it's his style, artsy. I don't know how much yarn these little cuties used up. I do know they are still played with lots! I eventually got my laundry basket back. They have all sorts of other cool places to sleep (even a kitty condo, as I have named it). The picture above, was a day or two after we brought the babies home. Thomas sent it to me while I was at work. 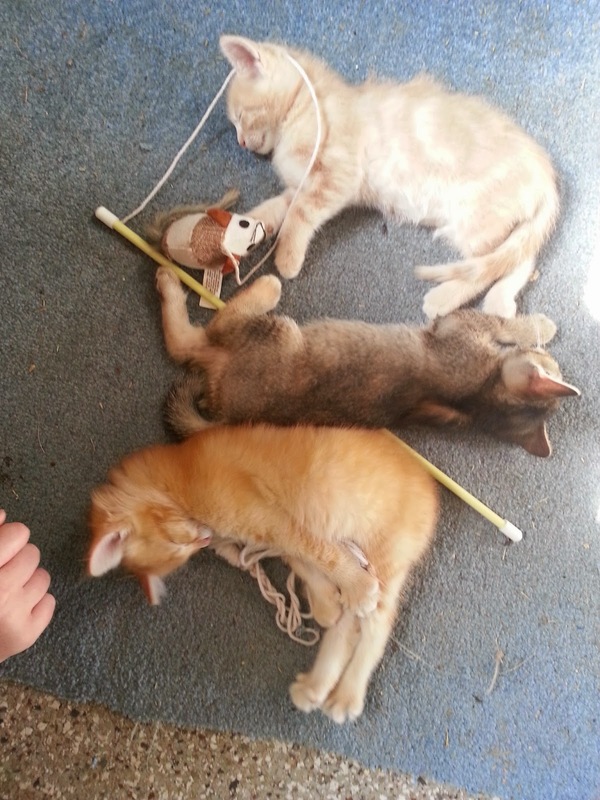 They played so hard, they all fell asleep together with their toys. AW! So, the baskets were our egg baskets. 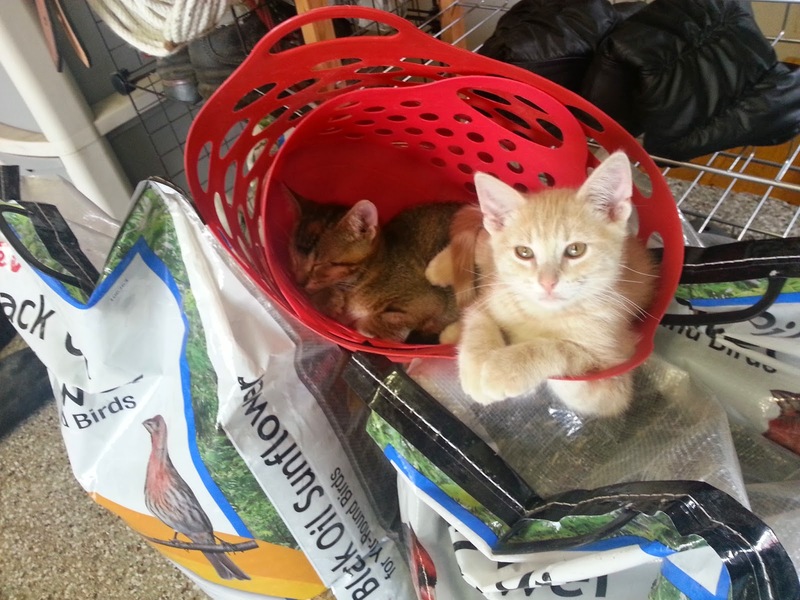 We don't have all of these baskets anymore, but while we did, the kittens thought they were a great place to cuddle and nap. That is Scruffy and Julie in the baskets. Sleepy little Bobo with gloves, in a shelf that used to have shoes. When I was about four, or five, years old, I had more than one kitten that got under my Dad's car, or under the lawn mower... and I didn't have a kitten that lived till my brother's cat, Tiger, had babies (That was Muffin. He was the runt of the litter, but lived from me being 5 years old until I was 21 years old). But more about my nervousness and worry about running over these little ones. They were sleeping on the bench above their food dishes. Ellie was watching them. I started up my SUV and they woke up. I didn't realize the garage door wasn't all the way up yet. In my hurry to get out of the garage before the kittens got active, I ran into the garage door... and damaged the door, which had to have a panel replaced. Ugh... I should have bought this pet carrier before we brought the kittens home. We began putting them in the carrier every time someone went in and out of the garage. Now they are over a year old, and unless we need them to stay in the garage, they are free to come and go when the garage door is opened. They learned to stay away from the vehicles when they are running. When the vehicles are not running, the cats love to play on them and sleep on them. These are pictures from when the kittens first started climbing trees. I really enjoyed seeing them figure that out. They are so smart. Scruffy is on the tree in the above picture, with Julie watching from below. Wyatt has his back-up chicken coop next to the deck. The blue gloves are for handling yucky things, like chicken business. Wyatt told me that the babies ripped off his glove here. Both boys up the tree! The kittens were very curious about the chickens. Thankfully, they don't do anything more than watch them, or sometimes scare/surprise the them like our cat, Butter, used to do. That is Bobo on top of the little coop. That was a temporary coop for chickens that were not big enough to integrate with the older flock yet. I caught Scruffy mid-jump onto the tree above. Below, the boys practice fighting, with Julie looking on. She is a fighter, too, though. Cute Julie Bear. All the kittens are so unique. They have their own personality. I didn't realize how different cats could be. I've never had more than one cat at a time for a long period of time. Julie meows, but is not as talkie as her brother, Bobo. She mostly meows when she doesn't think she's getting enough attention. She is the littlest of the cats, but still a fierce hunter. You should see her handle a snake! She loves to lick people when she is loving on them. Julie knows she belongs to me and Thomas; we are not allowed to pet the boys more than we pet her, or she gets totally jealous. She enjoys being cuddled in your arms like a little baby. Told you Julie fights, too! Handsome Fluffy Pants (aka Bobo). He is the talkiest kitty I've ever known. He has a happy meow, a "pet me" meow, a "pay attention to me" meow, a "let me in, or come and see me" meow, a "pick me up" meow, and more. He paws at the door to the kitten for attention. He has made slick spot on the door where he paws. He is the neediest kitty I have ever known, and the most loving. He is the quickest to purr, and the loudest! If you are not giving him enough attention, he will jump up on your leg! He loves hiding under maxi skirts. He attacks and bites skirts, and he claws jeans. You can hold Bobo any way you want. He just likes to be held. Spoiled me, with the automatic litter box. That was originally my parents (Thank you, Mom and Dad!!!). We used the litter box for our old cat, Butter. The kittens were surprised when the litter box scooped and dumped all on it's own, but they got used to the box right away. Thank you God for that one! Bobo is the neatest in the box. He will even jump in and cover up things if his brother, or sister, has not covered up their business well. Scruffy getting ready to pounce. I love when I find one of the cats all scrunched down in the grass ready to hunt. Scruffy is the most timid with people, but fierce with animals, even with our "new" puppy (that's a story for another post). He hated to have his face touched at first. Ellie worked with him, and he is her kitty. He doesn't mind her touching his face at all now. He loves her so much. If I come out and he thinks I am Ellie, then he realizes I am not, you can tell he is disappointed. He still doesn't like his face, or head, touched as much as petting the rest of him. Don't surprise him, and pet his head when he is unaware; he will walk away from you. But if he wants some pets, he will rub up your legs, and sometimes wrap his arms around your legs. He occasionally love-bites. Scruffy likes to be held with his head against your shoulder. Thomas loves that Scruffy follows him around when he is outside working. He does just like our old cat, Butter, used to do. Thomas loves his companionship. This was just too cute, with Scruffy's arms all wrapped around the basket! Julie and Fluffy taking a nap, but Scruffy wants to play! The kitties all come in at night to sleep. They come in and out during the day to eat, drink, nap, and get pets and cuddles. They have been in the house far more than our old cat. Sometimes we let them in just to play with and love on them. Our old cat just had a path from door to door when he wanted in or out. These babies are spoiled and loved, and they know it. Sometimes one of us will look out at the kitties and just say, "Awww!". Then someone else will ask what they are doing. And the other will say, "Just being cute." They manage to do that even just sitting, or sleeping. They make me smile, and sigh. They are such stress relievers. People thought we were a little crazy to get three kittens. Sometimes I thought we were a little crazy to get three kittens. I am so glad we did though. I am thankful to the family who gave them to us, to my husband who insisted these were the kittens for us (even though we had to travel over an hour away to pick them up), and thankful that God blessed us with these sweet kitties to care for. I have plans for more kitty posts in the near future. I'll also be posting on the movie War Room from the Kendrick Brothers and Provident Films. I was able to attend a pre-screening of the movie, and I can't say enough good about this movie. Old Fashioned is not so old fashioned, it's a real movie about messy life that has been around since the beginning of time, and the happiness that forgiveness and real love can bring. 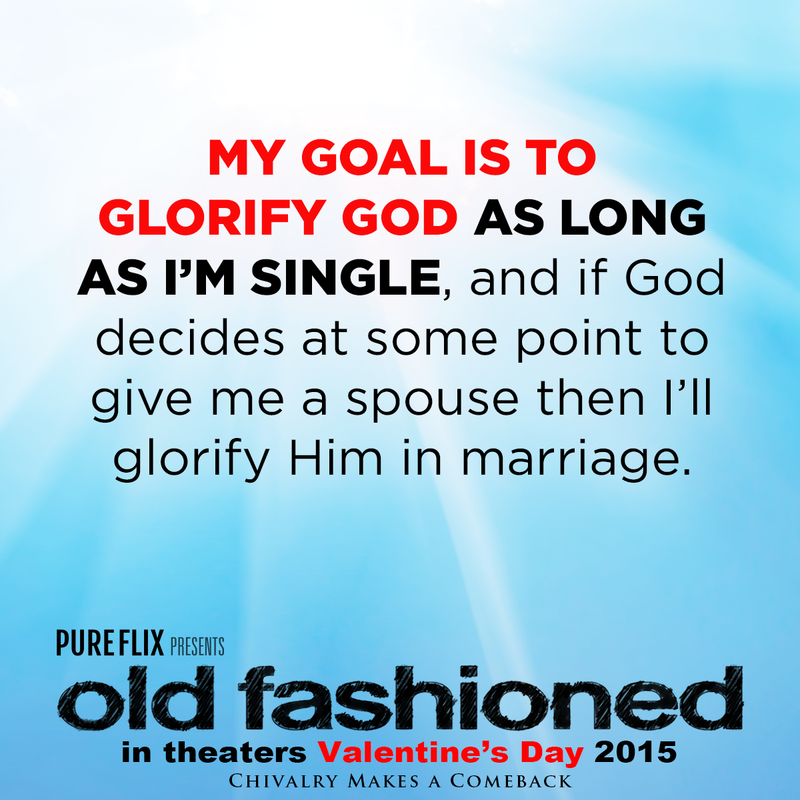 I have to admit, that when I saw the first trailer for Old Fashioned, I really wasn't very excited for this movie. I had an opportunity to prescreen the movie, but I was going to pass. I thought, "Maybe I'll see that movie when it comes out on video." Thankfully, my hubby saw the trailer, and he said, "We have to see this movie!" There is only one other movie that my husband took me to that I really didn't know what I was in for, but just like this movie, I was so glad he took me. That first movie was Joshua (2002, starring Tony Goldwyn and F. Murray Abraham), and that has been one of my favorite movies ever since. Old Fashioned is definitely in my top 10, maybe even my top 5. This is not your typical seen-it-all-before "Hallmark" type romance story. It's not an "everyone is perfect" Christian movie that some might think any movie associated with the term Christian might be. My daughter pointed out to me the other day that books at the library get an "R" on them for Restricted, but they also get an "R" on them for Religious. 50 Shades of Grey was rated "R" for "unusual behavior", and from what I've read about that book to movie adaptation, it's not the type of unusual behavior I want to see. In contrast, Old Fashioned is the Romans 12:2 kind of "unusual behavior"... you know "Do not conform any longer to the patterns of this world...". I have to tell you, Old Fashioned is an awesome movie. Visually, the movie is beautiful to look at, the background, the costumes, the actors and actresses, even the furniture and vehicles. The main female character dresses modestly. I really like her outfits; some of them were cute dresses with leggings and boots. She only wears pants once in the movie that I can remember, that is the sign of a timeless movie to me. The soundtrack enhances the experience of the movie, and I love how an old fashioned record player is used multiple times. Old Fashioned is a real story, the characters are people you might know, with real pasts and struggles, and real hope and love. Rik Swartzwelder is the Writer/Producer, but since the actor playing the main character in Old Fashioned dropped out at the last moment, he also became the main character, and I'm glad he did. This video on "The Heart of Old Fashioned" tells the story behind the film, and is really worth watching. So, Clay was a bad-boy, frat boy for most of college, but then he found God, and became a Christian. He set some really high standards for himself, especially in the area of women. I say "really high standards", but I agree with Clay that they are God's Standards, and honestly, 90 years ago, when my great-grandparents were courting none of those standards would have seemed strange. (Yes, I met my great-grandparents, knew them, and heard their stories. They were married 73 years and 11 months before they passed away within about a month of each other.) So, Clay's theories on dating intrigue Amber, and she finds ways to talk to him. It's in the trailer, so not a spoiler, that Amber breaks things in her apartment just to get Clay to come up and talk to her while he's fixing them, even though she has to stand outside the screen door, wrapped in a quilt. Eventually they begin courting. And back to the real-ness of the movie, there are moments when I was on the edge of my seat. I didn't know what the main, or side characters, were going to do in some tough situations. Oh, seriously, I was holding my breath, and just hoping for them to do the right thing. We also get glimpses into Clay's past, Amber's past, and the current seedy life of one of Clay's college friends. So, this is not a movie for young children. Nothing is distasteful or anything that I wished I could go back and cover my eyes, or my ears, but you will know what is being referred to, or going on. I said in my notes at the theater that they did a good job showing bad things, without actually showing bad things. I will tell you that my hubby and I are talking our 12 year old son and 14 year old daughter opening weekend. There is so much good to talk about with your teens, so much to think about if you are planning on getting married, or are already married. Here's a comparison between Old Fashioned and 50 Shades of Grey, custom made for parents; these are two "Valentine's" movies coming out this weekend. SPOILER ALERT: I love the boxes they make for each other to choose what they are going to do on their next date/outing. I love when Amber is reading the Bible she bought and reads out loud: (Hebrews 13:5 or Joshua 1:5) "I will never leave you nor forsake you." (not sure which it was, so that quote may not be exact). "...."Never will I leave you; never will I forsake you."" You can just tell she had a moment with God. I especially love the happy ending, with a whirlwind makeover including so many touches that show how Clay listened to Amber, and which includes a kiss on the check. Only, I would have rather they gave Amber an up-do with her pretty hair, rather than straightening the curls. P.S. : So, we took our children (teen and preteen) to the movie today. Daughter loved it! Son thought it was boring. I did not laugh as hard, or hold my breath as much, but I knew what was coming. I smiled A LOT! I saw a few things I missed before. I forgot to tell you all that the movie takes place in Ohio, which is Rik Swartzwelder's home state. I really enjoyed the setting. It reminded me of any random small town in the Midwest (like home), and the back roads looked like the roads around my grandparent's farms. After watching the movie again, I want the soundtrack. There are some really pretty songs on there. And the record player was a Victrola; I wanted to say that before, but, again, second guessing myself. 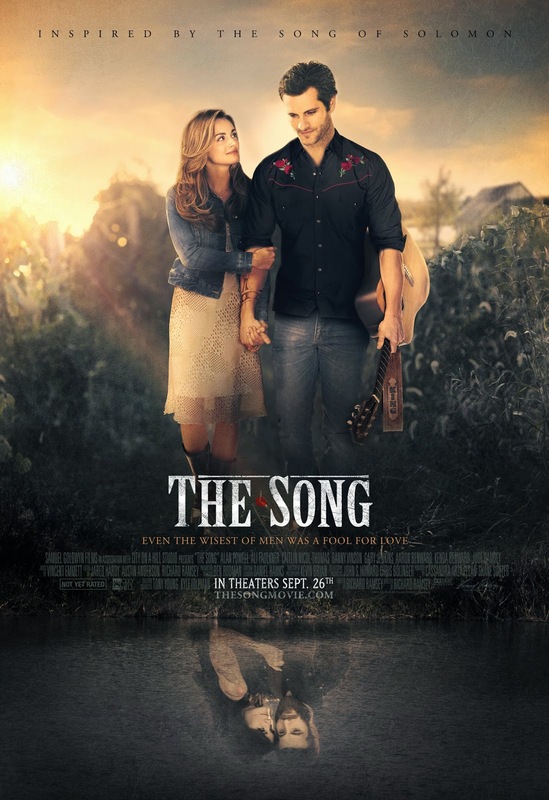 I was very excited after seeing the movie trailer, which you can watch at thesongmovie.com. I don't remember ever seeing a romantic drama based on a Bible history, filled with music. In case you didn't know, I love music! (I must say, I'm a sucker for a musical. BUT this is NOT a musical.) Two of the greatest songwriters in the Bible, as far as I'm concerned, are King David, and his son, King Solomon. So, the writers did an amazing job adapting their story to modern days, and making them Country music singers, and songwriters. I was a little worried that the music would be cheesy, or I don't know, just not all that good. My worries were for naught, the music was amazing! Even if you are not a Country music fan, you will still enjoy the music. You can download a free copy of the title track from the movie in "The Store" at thesongmovie.com, and see for yourself. I cannot wait until the whole movie soundtrack is available. I am really enjoying listening to The Song download, and remembering the movie. My nervousness about seeing the movie was in how much of the King David story would be in the movie, and how that would be done. I have to tell you, just the right amount of the Kind David story was included to give the Solomon character background for his story. Also, if you are familiar with Kind David's story, I must tell you that the scandalous parts were done tactfully and tastefully. The viewer is not left guessing what's going on off the screen, but you could watch the movie with your children, and not need to cover their eyes. I will say that if your kids are still reading a children's Bible, they are probably not ready for this movie. The viewer must be prepared for the drugs, alcohol, adultery, a wedding night, and a happily married couple. The most naked you see is naked shoulders, and there is only one kiss, but there is plenty of romance. I loved that there was only one kiss in the movie, and I found out after the movie that the actor who played Jed, Alan Powell (lead singer of Anthem Lights), was kissing his real-life wife, thanks to lighting and camera angles, just like Kirk Cameron did in the Fireproof movie (SO COOL!!). I love that the movie shows how timeless the Bible is. I like how the writers use the Bible verse, Ecclesiastes 1:9 '"There is nothing new under the sun." The wise words of King Solomon are so true. I don't think someone who is not familiar with the verses that are being woven into the the songs, the narration, and the overall history being shared, would even realize this was based on books of the Bible. The movie is rich with quotes from the books of the Bible written by Solomon: Proverbs, Ecclesiastes, Song of Solomon (or Song of Songs), and made me want to read them all with fresh new eyes (like after I read a Biblical Allegory book). I thought it was so cool how the writers brought in the aspects of Solomon asking God for wisdom and building the temple into modern day (just wait till you see how they do that!). For those that aren't familiar with those books of the Bible, the movie is not at all preachy. This is real life, as I said, the Bible is timeless. In the movie, King David's character is David King, a Country Music Star. The Solomon character is Jed King, who ends up being a Country Music Star. Jed's wife is named Rose. I could so relate to Rose in the movie when she is tired, and feels used and unloved. I wanted to yell at her (like people yell at soap operas), because I had been there, and I know now how a wife should act and react... and she was not doing what she should just then. I felt bad for Jed, because he was just a man, the way God designed him, that wanted to pour out his love on his wife. This movie is a feast for the eyes: the imagery, the costuming, the hair (where are the pictures, so I can pin them to Pinterest??? ), the contrast between the two women in Jed's life. The picture that the cameras gave us of the relationships were beautiful. There was the father & son relationship, first between David and Jed, and later between Jed and his son, Ray. The courtship of Jed and Rose was also beautiful to watch. With the beauty and the drama, there were also some laughs mixed in. When Jed and Rose first meet, they have a pretty funny conversation. Shortly after, Jed performs an even funnier impromptu song. And isn't there always a laugh to be had when a young man is asking permission to date a man's daughter, a man who has plenty of hunting "trophies" on his walls?! The Song is a great date movie! The Song is even a great family movie. I hope that people who watch this movie will come away realizing that the Bible really does have direction and answers for all of life's problems. Life really hasn't changed that much. What we wear, and our technology are different, but as the Larry Norman song says: "Nothing really changes, everything remains the same." For me, a wife, I hope that all the wives out there will watch this and be thankful for their husbands. I hope that she will realize that no matter how frustrating, or annoying, or whatever thing her husband might have done lately to drive her crazy, that there are women out there that are literally waiting for an opportunity to ruin her marriage (even if you think your husband is not desirable as when you first met). We have a copy of the movie poster hung up on the way to our laundry room. Whenever I pass the poster, I am reminded to appreciate my own husband. Add The Song to your calendar on September 26th now, so you won't forget. There is a happy ending. I adore happy endings. And I really hope they tack on the bonus scene that we got to see after the credits. I thought that was the perfect ending. I'm so behind on these posts, but some are just hard to write. Pets become so much a part of our lives. This is the story of Butter, our cat. Ellie and I were playing on her swing-set in August of 2001, when the neighbor ladies from either side of our house were visiting with each other. The neighbor lady to the south of us told us (well, probably really me, because Ellie was not quite a year old yet) that two kittens had been abandoned at the tennis courts in town, and she thought they were de-clawed. Being de-clawed did not thrill me, and thankfully, they were not de-clawed. I didn't want to have a cat indoors, and really couldn't, because Thomas is allergic (turns out, I am the only one in the family that is not allergic). The lady to the north of us pointed out that we were the only family in the neighborhood that did not have cats. That really didn't bother me with a toddler to take care of, and a part-time job, and a husband, and a dog that was just barely a year old. I grew up having a cat, from age 5 to age 21, so the thought was tempting. The neighbors urged me on, and Thomas was at the tennis courts playing tennis. So, Ellie and I loaded up to go see kittens. The kittens were friendly and playful. The orange one looked just like my cat, Muffin, when he was a kitten. Oh, I wanted to take him home and love him. Thomas was fine with that, as long as we took both kittens. That surprised me! I really thought he would say "no, cats". What he said was, "We can take both home, or neither one home." Well, I couldn't leave that little orange ball of sweetness. Ellie thought they were wonderful, too. Thomas said something about the white and gray one, I thought he said he was going to call it Spider. I completely heard him wrong, but the name stuck. I named the orange one Butter. Ellie learned how to pet them the right direction, and be gentle with them. She was so young, I know she doesn't remember being taught, but she learned well. The kittens never scratched her, or got upset with her. 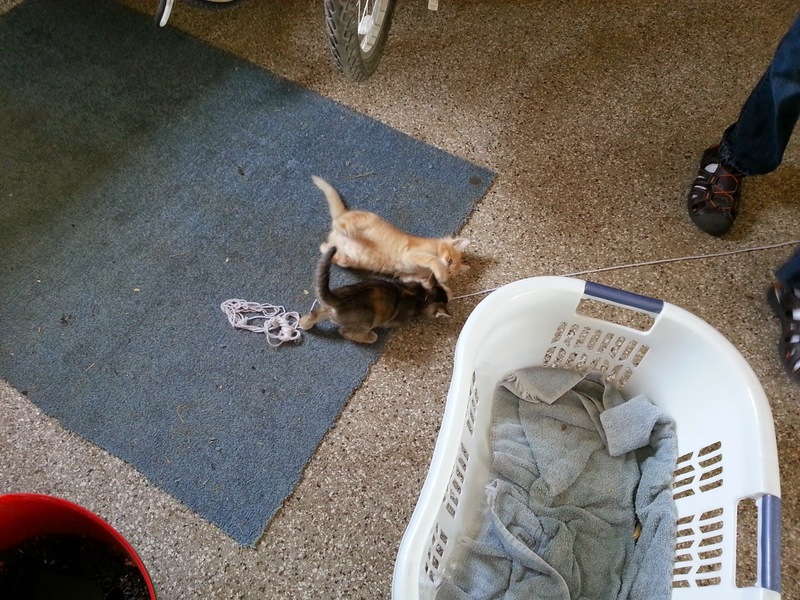 This picture is of the kittens in our garage, shortly after we brought them home, with a makeshift litter box (cardboard box and oil dry), and I don't know where we got the wet cat food and plastic bowl. The kittens later had their own food bowls, a real litter box, and dry kitten chow. Having kittens and a toddler (baby, really still) was challenging. I really had no idea how to have outdoor kitties and make them realize where their home was. We kept them in the garage for a bit, in our white shed for a short time, but mostly they were outside. Our dog, at first, thought they were something to destroy. We found her shaking them. She would chase them up a tree. We were forever running outside to rescue them from our own dog! They also roamed to the neighbors. The same ones who told us we needed cats apparently had many visits from our kitties. We didn't find out until years later, but the neighbors to the north of us had a cat door, and our cats liked to use the door and follow their cats in the house. I would not have a cat door, living out in the country like we do. I would be afraid of what might walk in someday... like a skunk, or something! The neighbor to the south of us said her husband would always chase them off. She didn't mind them hanging in the yard, or garage with their cat, but I was glad her husband chased them off. Seriously! Send them home, or let us know to come and get them. A couple of our neighbors admired Spider. She was super friendly, cuddly, and you can see her long hair. She had bright blue eyes. She was gorgeous! One day she never came home. I have a strong feeling she became a house cat. We took the cats to the vet and had them fixed and given their shots. So, we still had a Butter kitty. He was friendly, but mostly liked to sit in Thomas's lap (the one who is allergic). He was a great mouser! And we needed one of those. I can't stand mice. They creep me out. And out here in the country, there are plenty of mice, looking for a meal and a bed. Butter loved to leave us presents of his kills on the deck, in the garage, on the porch... oh, how he loved us. Once, Wyatt accidentally shut the cat's tail in my car door. The cat was on the roof of the car, and Wyatt didn't know his tail was in the door. The cat clawed Wyatt's head, because he was trying to grab onto something... he was hanging by his tail. Butter was fine, his tail was fine. 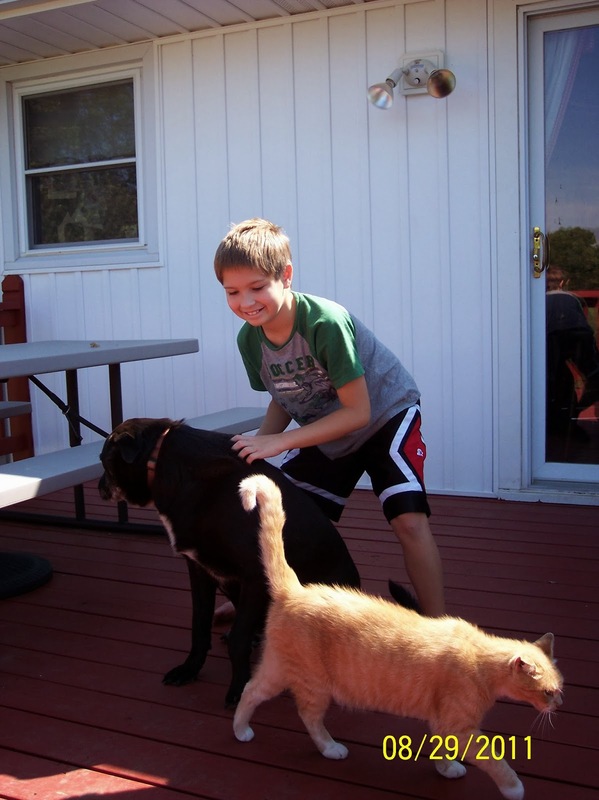 Wyatt was scared, and I was worried about what might be on the cat's claws that dug into the skin on Wyatt's head. Wyatt turned out to be fine, too. Eventually, the neighbors told us about our cat coming in their house. The husband said our cat was feral , because he fought with their cats. The wife said that the cat wants to be a house cat, because they would come home and find him curled up on one of their beds. 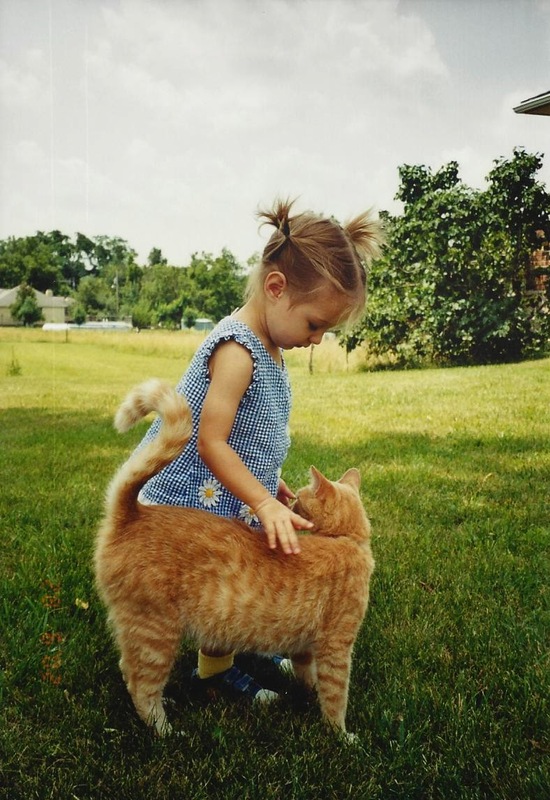 Butter was obviously not feral, he was super friendly to people (he even put up with little children petting him when he was old). We couldn't make him a house cat because of allergies, and he loved the outdoors. To smooth things over with the neighbors, for a while we kept Butter in the garage during the day and only let him out in the evening. Their cats were out during the day, and put up at night, because they were de-clawed. 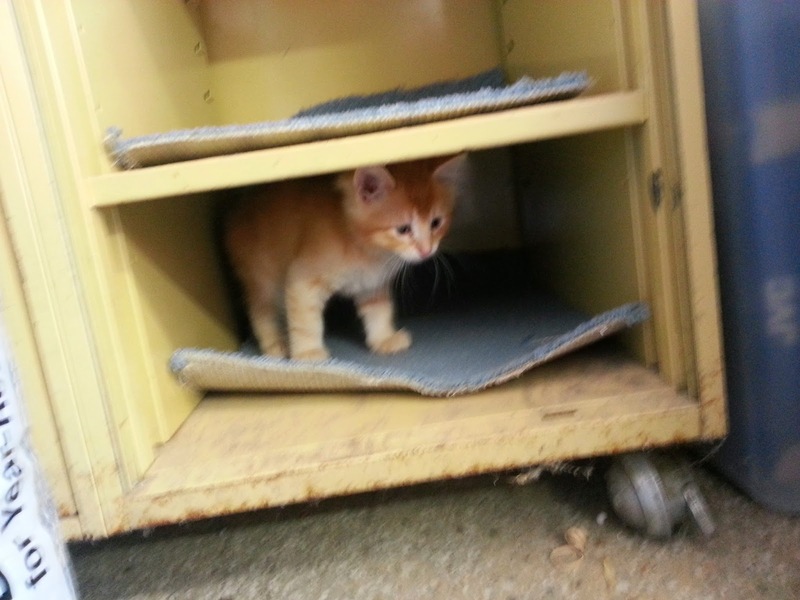 Butter really learned where his home was while he was "stuck" in the garage. I don't think he ever spent too much time at the neighbors after that, though I know he still wandered the neighborhood and hunted in the fields. I loved to drive home and see his green eyes shining in the dark. He would crouch down in the grass, like he was going to stalk the car. He made me smile. Then, he would run and follow us home to get in the garage for the night. Butter was a tough cat. He did get into fights. He killed snakes, salamanders, birds, rats, rabbits, and mice. He even killed a possum once. You can see one of his ears is floppy. He got hurt, and that is the way it healed. As I said in the post in Memory of our Libby dog, the dog and cat became best friends after a few years. The hung out together, cuddled together, and the cat would even "massage" (with claws!) the dog's back. Butter even taught Libby to clean her paws with her tongue like a cat. They were totally best friends. He looks like a tough character, doesn't he? But he had a soft heart for Libby and his family. He knew just when you needed a leg rub, or time to pet him and relax. I made this bench for Ellie's room many years ago. Eventually, the best place for the bench was in the garage as a place to store rubber boots, and sit to put them on and off. Butter decided the bench was his bed. He slept there nearly every night after I put the bench there. He was funny, too. He kind of adapted to our schedule in later years. He would hunt and run around during the day. Many times in the last few years, he would want in and out all day long. He learned that if he snuck in the door to the kitchen and waited by the patio door, we would let him out there. Also, if he meowed outside the patio door (or snuck in there), we would let him through the kitchen out into the garage. He was a smart kitty. I think Butter was lonesome after Libby died. I know my childhood cat, Muffin, didn't last too many years after our dog, Duke, died. Butter seemed to be looking for Libby, and had a questioning, almost mournful meow at times. Butter appeared to decide that he needed to take over the job of dog, as well as his role of cat. He would follow us out to the barn when we did chores, or put the animals up at night. He was right on your heels, just like a dog would be. You can see in the picture below that he took on the job of babysitter/guard. I don't know if age, a broken heart, or being overworked took it's toll on our cat, but I went through the garage to the basement on Monday night, January 13th, and Butter was there on the bench. He lifted up his head to look at me. I usually apologized for turning on the light and interrupting him. The next morning, Thomas woke me up to tell me that our cat died. Thomas found the cat on the floor, near the front of my Envoy. Wyatt and I buried him that day. Mid-September of 2013, we got one Rhode Island Red, two (Plymouth) Barred Rocks, one Pearl Grey Guinea, and one Lavendar Guinea, all chicks from Orscheln Farm and Home. The Rhode Island Red is named Pippi. The Barred Rocks were named Rudy and Litter Box. The Lavendar Guinea is named Laverne, and the Pearl Grey Guinea is Shirley (shemezel, shimzel, hasenfeffer incorporated). This is Pippi, our Rhode Island Red. This is Rudy, one of the Barred Rocks (or Plymouth Barred Rock). This is Litter Box, who was supposed to be the Dark Knght, but was the name Litter Box stuck, after this one found his way into the cat's litter box in the garage multiple times. This is Laverne. She is a Lavendar Guinea Fowl. This is Shirley ( of Laverne and Shirley, Wyatt wanted a special name for the Guineas and Misty suggested). Shirley is a Pearl Gray Guinea. When they were little babies, they lived in the garage. When they got bigger, we moved them into the A-frame chicken coop. When the weather got cold, we introduced them to the big coop with the rest of our chickens. We called them "the little gang", because they were always running around together. You never saw one without the others nearby. They were SO cute! This is the Guinea Girls holding claws. See the two claws on top are intertwined. The Barred Rocks grew fast and large. We began to suspect that one, if not both of them, were roosters. Once they started crowing (and they sounded like a wolf howling compared to our little bantam rooster! ), we knew they were both roosters, and they couldn't stick around the homestead. They were chasing hens, and upsetting Rotisserie (our resident rooster). Which was making Rotisserie aggressive, and he had been pretty tame. This is Rudy. Mr. Homesteader behind him. And to the far, back, left is Toy Pony. Here you can see Rudy, Laverne, Pippi, and Litter Box is behind Laverne and Pippi. This is how they were usually seen, if not closer in a group. Litter Box is in front of Rudy. The Guineas are right next to each other, and Pippi to the far left. The chicken farmer is up on the stairs to the back garage door. The Guineas were loud as everyone said they would be. We tried to take the roosters somewhere to be butchered (like we did with some of our meat birds, and the two previous accidental red roosters), but no one was butchering chickens around us anymore. So, Thomas called on his friend, and they were going to butcher the roosters, and we (Thomas and Misty) decided the Guineas had been a long enough experiment, so they were going to be meat birds, too. Only, the week that we were going to butcher them, the Guineas earned a pardon. They alerted the kids and I to a coyote in our back acreage. We had to scare the coyote off multiple times, and keep watch the rest of the day until the chickens went into the coop for the night. The Guineas squawk was different than normal and alerted Wyatt. When he looked outside, he thought it was a fox, or a dog. Ellie thought it looked more like a wolf, or coyote. I recognized the animal as a coyote. The kids didn't want the Guineas to die anyway, but now I had a reason to like them, too. I promised the kids, I would petition their Dad for the Guineas to live. He didn't have much problem with that idea, when I told him how they saved our flock. Here are our feathered watch dogs, Laverne on the left, Shirley on the right. Wyatt is currently reading a book called Guinea Fowl that we purchased at Cackle Hatchery. He is always researching and learning about his birds. Guinea Fowl are called the feathered watch dogs of the barnyard. We certainly agree with that! They make a sound like "buck-wheat, buck-wheat", but the girls also make the "chi-chi-chi" sound that the male guineas make. The males only make the "chi" sound. The "buck-wheat" sound is unique to the female guinea fowl. If you are a brave homesteader, the meat of the guinea is supposed to be superior to any barnyard fowl or game bird (excluding the Royal Purple Guinea). You could easily raise them for meat. They don't require much feeding. They love bugs! Our chickens love bugs, too. We have had the least amount of bugs ever since having chickens and guineas. Besides having a plethora of fresh eggs, the best part of having chickens (for Misty) is the lack of bugs! Pippi, Shirley and Laverne; all that is left of the Little Gang. Thomas and his friend, Michael, ended up butchering the Barred Rock Roosters. The Guineas and Pippi were adopted by Rotisserie (our Black Cochin Bantam Rooster). Rotisserie and the Guineas remind Thomas of Darth Vader and the Storm Troopers from Star Wars, because the Guineas look like the helmeted storm troopers and are frequently "guarding" the black clad Darth Rooster. Words that describe me: Jesus Freak, Help Meet, Homeschool Mom, Tree Hugger (Reduce, Reuse, Recycle! 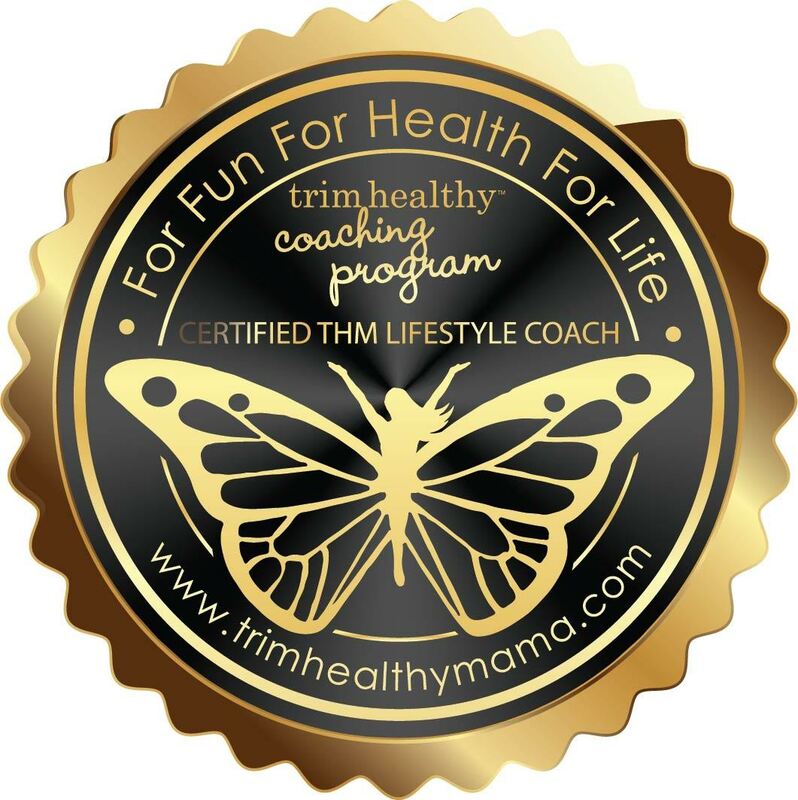 ), Reader, Writer, Different, Wild, Conservative, Natural (as in natural foods and cures), Daughter, Granddaughter, Niece, Sister, Aunt, Cousin, Friend, and Trim Healthy Mama. 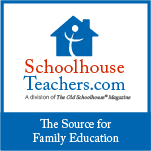 All content, except outside links and where noted, is property of the author of this blog.. Simple theme. Theme images by gaffera. Powered by Blogger.